With the realization of one’s own potential and self-confidence in one’s ability, one can build a better world. Chakra is a Sanskrit word and it means “Wheel” or “Vortex” because that is what it looks like when we look at it. Each Chakra is like a solid ball of energy interpenetrating the physical body, in the same way, that a magnetic field can interpenetrate the physical body. The Chakras are not physical, they are the aspects of consciousness in the same way that the Auras are aspects of consciousness. The Chakras are denser than the Auras but not as dense as the physical body. Chakras interact with the physical body through two major vehicles, the endocrine system and the nervous system. 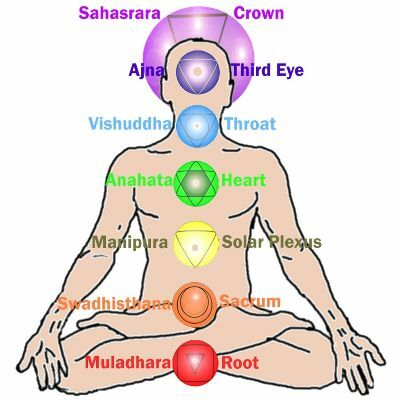 Each of the seven main Chakras discussed here are associated with one of the seven endocrine glands and also with a particular group of nerves called a Plexus. 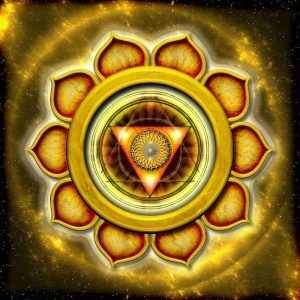 Thus, each of these Chakra’s can be associated with particular parts of the body and particular functions within the body controlled by that Plexus or that endocrine gland associated with that Chakra. 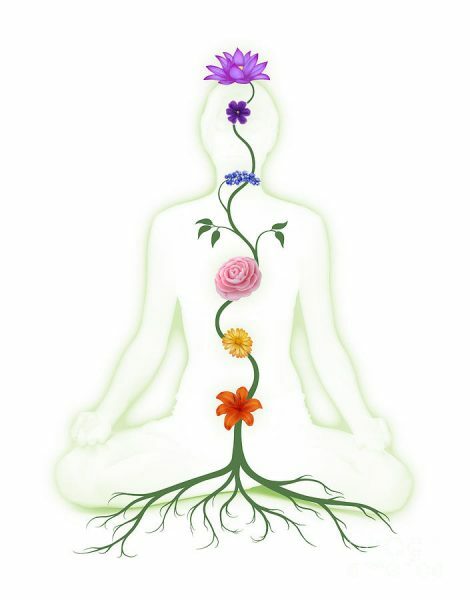 Each of the Chakra’s or Energy Centres has Governance over particular areas of your body. One of the strongest associations to affect your health and well-being is that formed with your Endocrine system. The endocrine system is part of the body’s main control mechanism. It comprises a number of ductless glands that produce the hormones, acting as chemical messengers, that are secreted into the bloodstream from particular organs to stimulate or inhibit physical processes. By adjusting the hormone levels, the endocrine system works to maintain the body in a state of optimum health. The Chakra’s are linked with the glands responsible for creating the hormones. 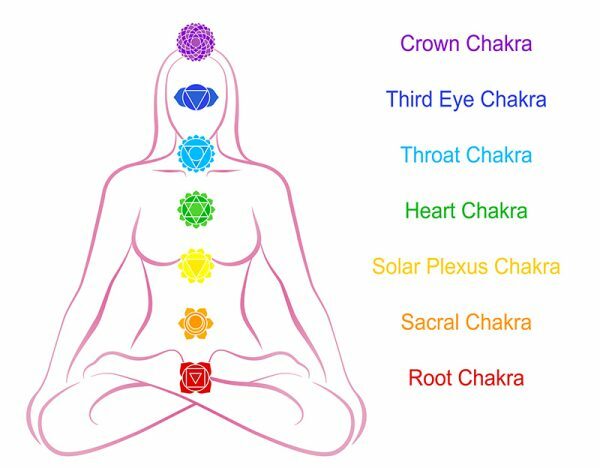 Unsurprisingly, the positions of the Chakra’s, correspond to the positions of the glands in the endocrine system and have an effect on their functioning. The link between the Chakra’s and the glands emphasises the holistic nature of health and demonstrates that you need to maintain a balance in your emotional and mental activities as well as your physical diet and exercise, as they are all deeply interrelated. The Chakras located in the lower part of our body are our instinctual side, the highest ones our mental side. The Chakras can have various levels of activity. When they are open they are considered operative in a normal fashion. Ideally, all Chakras would contribute to our being. Our instincts would work together with our feelings and thinking. However, this usually is not the case. Some Chakras are not open enough (being under-active) and to compensate, other chakras are over-active. The ideal state is where the Chakras are balanced. It makes no sense to try to make over-active Chakras less active, as they are compensating for other Chakras which are under-active. To restore the compensation, they would be over-active again in no time. To stop them from compensating, the Chakras they are compensating for must be opened. Then all Chakras will be in balance. A variety of health problems may be caused by Chakra Imbalances affecting the associated Endocrine Gland and resulting in illness. By receiving Energy Healing, you can help keep yourself healthier by taking the Holistic approach. Here are a few brief examples of each energy centre and its associated symptoms and issues. BASE/ROOT CHAKRA (Base of the spine, energy colour Red). Anorexia, Obesity, Osteoarthritis, Auto-Immune Disease, Arthritis, Cancer, AIDS, Fatigue, Kidney, Spinal Column, Issues are security and survival. The Root Chakra is associated with the Adrenal cortex glands. It is the centre of physical energy, grounding and self-preservation. The Root Chakra governs the back, feet, hips, spine and legs. 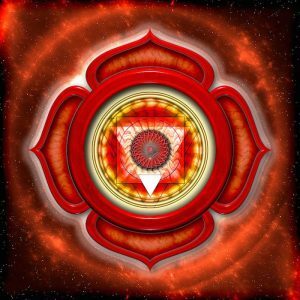 The Root Chakra is about being physically there and feeling at home in situations. If it is open, you feel grounded, stable and secure. You don’t unnecessarily distrust people. You feel present in the here and now and connected to your physical body. You feel you have sufficient territory. If you tend to be fearful or nervous, your Root Chakra is probably under-active. You would easily feel unwelcome. If this Chakra is over-active, you may be very materialistic and greedy. You are probably obsessed with being secure and resist change. SACRAL CHAKRA, (3″ Below the navel, energy colour orange). Bladder problems, Frigidity, Gall and Kidney Stones, Reproductive Organs, Vaginal Cancer, Prostate Cancer, Pelvic Disease, issues are – physical and material desires. 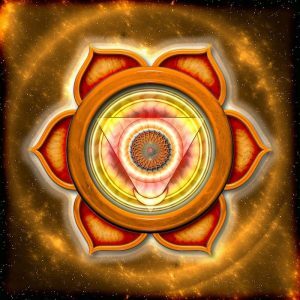 The Sacral Chakra governs the sexual organs, Ovaries / Testicles, bladder, bowel and lower intestine. This Chakra is about feeling and sexuality. When it is open, your feelings flow freely and are expressed without you being over emotional. You are open to intimacy and you can be passionate and lively. You have no problems dealing with your sexuality. If you tend to be stiff and unemotional or have a poker face, the Sacral Chakra is under-active. You are not very open to people. If this Chakra is overactive you tend to be emotional all the time. You will feel emotionally attached to people and can be very sexual. STOMACH/NAVEL/SOLAR PLEXUS CHAKRA, (above the navel, colour yellow). Diabetes, Digestive / Adrenal organ illness, Hypoglycaemia, issues are – power and control. The Navel Chakra governs the stomach, upper intestines, upper back and upper spine. This Chakra is about asserting yourself in a group. When it is open, you feel in control and you have sufficient self-esteem. When this Chakra is under-active you tend to be passive and indecisive. You are probably timid and don’t get what you want. If this Chakra is overactive you are domineering and probably even aggressive. HEART CHAKRA, (Heart region, energy colour green). Cancer, High Blood Pressure, Heart Problems, Thymus, Blood, Circulatory System, Involuntary Muscles. Issues are – Love. The Heart Chakra is associated with the Circulatory System and Thymus Gland. It is the centre of Compassion, Love, Group Consciousness and Spirituality. The Heart Chakra governs the heart, lungs, blood and circulation. As the Heart Chakra is about Love, kindness and affection when it is open, you are compassionate and friendly, you work at harmonious relationships. When your Heart Chakra is under-active, you are cold and distant. 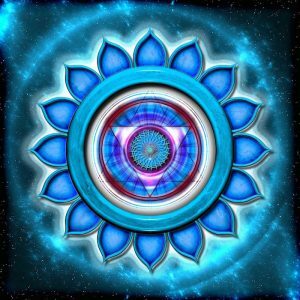 If this Chakra is over-active, you are suffocating people with your Love and your Love probably has quite selfish reasons. THROAT CHAKRA, (Adam’s apple area, Blue / Light blue energy colour). Asthma, Neck Problems, Lungs, Hypoactive Thyroid, Throat, Jaw, Alimentary Canal, Vocal Cords. Issues are – communication. The Throat Chakra is associated with the Respiratory System/Thyroid Gland. It is the centre for sound, communication, speech, writing and thought expression. The Throat Chakra governs the throat, thyroid, mouth, teeth, tongue and jaw. 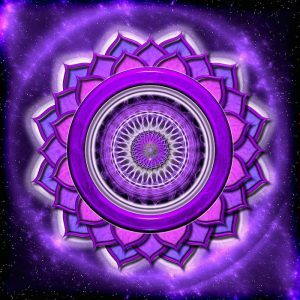 This Chakra is about self-expression and talking. When it is open, you have no problems expressing yourself and you might be doing so in a creative way. When this Chakra is under-active, you tend to not speak as much and you probably are introverted and shy. Not speaking the truth may block this Chakra. BROW OR THIRD EYE CHAKRA, (Between both eyes, Dark blue/Indigo colour). Glaucoma, Headaches, Neurological problems, Cerebellum, Nose, Pituitary, Central Nervous System, Left Eye. Issues are – clairvoyance. The Third Eye Chakra is associated with the Autonomic Nervous System/Pituitary Gland. It is the centre of psychic power, spirit energies, higher intuition and light. The Third Eye Chakra governs the pituitary gland, pineal gland, skull, eyes, brain, nervous system and the senses. This Chakra is about insight and visualisation. When it is open, you have a good intuition. You may tend to fantasise. If it is under-active you are not very good at thinking for yourself and you may tend to rely on authoritative people. You may be rigid in your thinking, relying on beliefs too much. You might even get confused easily. If this Chakra is over-active, you may live in a world of fantasy too much. In excessive cases hallucinations are possible. CROWN CHAKRA, (Top of head, Purple/violet energy colour). Exhaustion, Epilepsy, Cerebrum, Pineal Gland, Right Eye. Issues are – Spiritual Wisdom. The Crown Chakra is associated with the central nervous system/Pineal gland. It is the centre of enlightenment, dynamic thought, truth and oneness. The Crown Chakra governs the top of the spinal cord, brain stem, pain centre and nerves. This Chakra is about wisdom and being one with the world. When this Chakra is open, you are unprejudiced and quite aware of the world and yourself. If it is under-active, you are not very aware spiritually. You are probably quite rigid in your thinking. If this Chakra is over-active, you are probably intellectualising things too much. You may be addicted to spirituality and probably ignoring your bodily needs. At the top of the kidneys are the adrenal’s that produce several hormones including adrenaline, which stimulates the “fight or flight” response and ties directly to the Base Chakra’s survival drive. This Chakra is related to the gonads in males. The ovaries control sexual development and egg creation as well as controlling the levels of oestrogen and progesterone. The potential for life in the ovaries is mirrored in the drives of the Sacral Chakra. The energies of the ovaries link with the Sacral Chakra. The pancreas secretes substances for the digestion of food, such as insulin. When this Chakra is over stimulated it can cause problems with excess blood sugar, the major cause of diabetes. An under stimulated stomach Chakra can lead to ulcers. The thymus is located above the heart and produces lymphocytes, which form a vital part of the body’s immune response. This quality relates the thymus to the healing properties of the Heart Chakra. The healing promoted by this Chakra links it to the thymus. On either side of the larynx is the thyroid, producing thyroxine, which controls the rate at which the body converts food into useful energy. This is the area over which the Throat Chakra has dominance. The thyroid governs the rate of metabolism in the body. Near the base of the skull is the pituitary gland, which releases hormones influencing body chemistry. The spiritual energies of the Brow Chakra are reflected in the pituitary’s influence on the whole body. This Chakra works with the pituitary gland in the body. The pineal gland lies deep within the brain and produces melatonin. This hormone affects the other glands in the endocrine system and mirrors the Crown Chakra’s relationship with the other Chakra’s. This gland and Chakra hold sway over the entire system. By understanding the association between the Chakras and the glands you can see how Healing can benefit a multitude of illnesses affecting your mental, emotional, physical and spiritual well-being. The image on the left is showing how the chakras are like the petals of flowers that open and close. Your consciousness, your experience of being, represents everything it is possible for you to experience. All of your senses, all of your perceptions, all of your possible states of awareness, can be divided into seven categories and each of these categories can be associated with a particular Chakra. Thus, the Chakras represent not only particular parts of your physical body but also particular parts of your consciousness. When you feel a tension in your consciousness, you feel it in the Chakra associated with the part of your consciousness experiencing the stress and in the parts of the physical body associated with that Chakra. When there is tension in a particular part of your consciousness and therefore in the Chakra associated with that part of your consciousness, the tension is detected by the nerves of the plexus associated with that Chakra and communicated to the parts of the body controlled by that Plexus. When the tension continues over a period of time or reaches a particular degree of intensity, the person creates a symptom on the physical level. Again, the symptom serves to communicate to the person through their body what they have been doing to themselves in their consciousness. When the person changes something about their way of being, they are able to release the stress that had been creating the symptom and they are then able to return to their natural state of balance and good health. Everything begins with your consciousness. Everything that happens in your life and everything that happens in your body begins with something happening in your consciousness. Your consciousness, your experience of being, who you really are, is energy. We can call it “life energy” for now. This energy does not just live in your brain, it fills your entire body. Your consciousness is connected to every cell in your body. Through your consciousness, you can communicate with every cell in your body. Through your consciousness, you can communicate with every organ and every tissue. A number of therapies are based on this communication with the organs which have been affected by some kind of symptom or disorder. This energy which is your consciousness and which reflects your state of consciousness can be measured through the process known as Kirlian Photography. When you take a Kirlian Photograph of your hand, it shows a certain pattern of energy. If you take a second photograph while imagining that you are sending Love and energy to someone you know, there will be a different pattern of energy shown on the Kirlian Photograph. Thus, we can see that a change in your consciousness creates a change in the energy field that is being photographed, which we call the Aura. This energy field shown in the Kirlian Photographs has been quantified so that when there are “holes” in particular parts of the energy field, these are said to correspond to particular weaknesses in specific parts of the physical body. The interesting thing about this is that the weakness shows up in the energy field before there is ever any evidence of it on the physical level. a. A change of consciousness creates a change in the energy field. b. A change in the energy field happens before a change in the physical body. The direction of manifestation is from the consciousness, through the energy field to the physical body. When we look at things this way, we see that it is not the physical body creating the energy field, the Aura, but rather the Aura or energy field that is creating the physical body. What we see as the physical body is the end result of a process that begins with the consciousness. Energy healing can realign, unblock and balance your Chakras. This provides Healing on an emotional, physical and spiritual level which ultimately leads to better health, a better state of well-being. 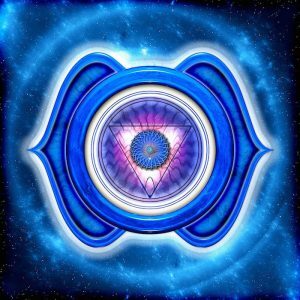 Try the Chakra Test site below to see how your energy centres are presently functioning. Have a try of this meditation video to clear and balance the Chakras.